Former European Poker Tour runner-up Andrew Chen battled back several times from a short stack to win the £10,300 High Roller event at the 2014 stop in London for £394,200. Chen, who finished second to Davidi Kitai at EPT Berlin back in 2012, secured victory after an incredibly brief heads-up battle against Lebanese player Fady Kamar. Ten players had come back at the start of the day and it did not take long for lots of action to take place. Team PokerStars Pro Johnny Lodden was first to be knocked out, pushing his last 11 big blinds into the middle with the , but running into Craig McCorkell's . Lodden flopped a five, but the Englishman rivered a nine to leave the tournament with just a single table of nine players. Niall Farrell had doubled up on the very last hand of Day 2, but he had still been one of the shorter stacks going into the final day. Farrell made a stand with jacks against start-of-the-day chip leader Leonid Markin. The Russian called with the and spiked an ace on the flop to increase his lead even further. 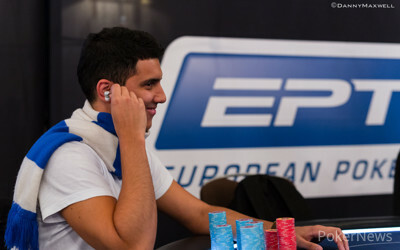 With the official final table now set, Salman Behbehani survived with two double ups in succession. First with aces against Markin's ace-king, then with two pair all in on the turn against Martin Quack's straight draw. Jorryt van Hoof, the 2014 World Series of Poker November Nine chip leader, had started the day second in chips, but he went out in some very cold hands against the seemingly unbeatable Markin. Van Hoof flopped top set with the on a board, but Markin had the for the flopped nut straight. The Dutchman couldn't pair the board and went out in a surprising seventh place. Not that he was too concerned, because he immediately jumped into the £5,000 No-Limit Hold'em Turbo event and managed to make his second final table in the space of just a few hours. At this point, Philippe D'Auteuil was the shortest stack, and he pushed with the . Fady Kamar isolated with the , and there was no king on the board nor enough hearts when it came . 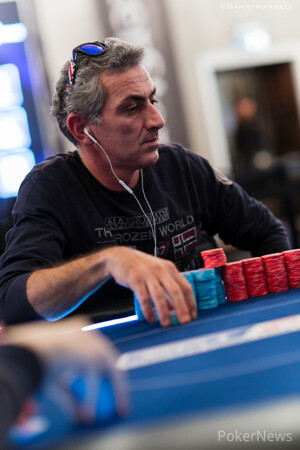 Kamar increased his stack while D'Auteuil was eliminated. Andrew Chen, Salman Behbehani, and Martin Quack were all under 20 big blinds, and a crucial pot went the way of Chen when he raise-called for his entire stack against Quack. Chen showed a dominating to Quack's and neither player improved. Quack was crippled, but managed two double ups before he eventually lost with the to Kamar's on a board. Salman Behbehani follwed the German out of the door in fifth place after getting unlucky. Behbehani shoved with the , but Kamar's spiked a jack on the turn to leave the tournament with just four. At this point, first McCorkell then Kamar began to assert themselves as Markin suffered several beats. He was first crippled when Chen shoved with the nut flush draw against the Russian's top pair, and then Markin finished in fourth after pushing the into McCorkell's . Three-handed play saw McCorkell immediately double with tens against Chen's nines before the Canadian recevied his own double up in return with the against McCorkell's . Following this, McCorkell pushed his last 22 big blinds in the middle with the , but Chen called with the and held firm on an board. The heads-up battle between Kamar and Chen saw Kamar start with a slight chip advantage. That was quickly wiped away in a cooler, though. Both players had two pair by the turn of a board but Chen's was better than Kamar's when all the chips went in. The on the river left Kamar with just two big blinds and he was knocked out the very next hand. Chen had the , once again with pocket eights, and this time he was against Kamar's . 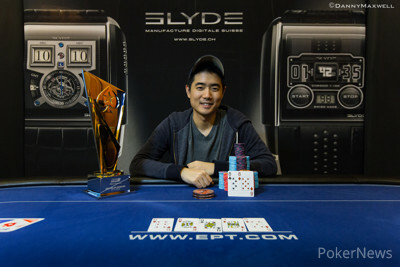 Neither player hit on the board, and that was enough to secure Chen the 2014 EPT London High Roller title. For us here at PokerNews, that wraps up our coverage of the 2014 EPT London High Roller. You can click here to view live updates from the Main Event, and then we'll be back in action for EPT Prague in December where PokerNews will have unrivaled live coverage of the three biggest events of the festival — the €50,000 Super High Roller, the €5,300 Main Event, and the €10,300 High Roller. Andrew Chen opened the action for 160,000 from the button and Fady Kamar three-bet to 260,000. Chen made the call. The flop was and Kamar check-called a bet of 400,000 to see the turn card come the . Kamar checked again and Chen announced a bet of 875,000 before sliding out the chips. Kamar check-raised all in and Chen quickly made the call. Kamar had turned two pair with but Chen had flopped the better two pair . A river finished off the board and the dealer counted down the stacks to find Kamar was left with just two big blinds. “Sick turn.” Chen remarked and there was no argument from Kamar. Kamar was all in next hand and had found a decent but Chen turned over . A final board of . Chen said, “That’s one way to do it.” He was the champion and a quiet but dignified Kamar was left to reflect on a close finish. Andrew Chen raised to 160,000 and Fady Kamar called in the big blind. Kamar check-called a bet of 175,000 on the flop before the turn and river were checked down. "Ace-high," said Kamar. Chen showed and picked up the pot. Craig McCorkell open-shoved from the small blind and Andrew Chen checked his cards and then announced "Call". The flop came and McCorkell needed a king or queen, the came on the turn meaning any paint was a winner but the river was the and Chen won the hand. There was a countdown, McCorkell's shove was for 1,745,000 but Chen had over 1,900,000 and the Englishman went out in third place. After a lot of limping and checking and one uncalled open shove from Andrew Chen it was a second shove for exactly 1,000,000 from Chen that got called by Craig McCorkell. Chen had and McCorkell was trying to knock him out with . The cards fell . Not even a sniff of sweat as Chen calmly doubled up. Players are on a 30-minute dinner break. Craig McCorkell limped in the small blind and Andrew Chen checked to see a flop which both players checked. McCorkell bet 80,000 on the turn and Chen called to see the on the river. This time McCorkell bet 180,000 and Chen again called. McCorkell turned over for two pair but Chen showed for a rivered flush, this pushed the Canadian back over the million mark in chips. 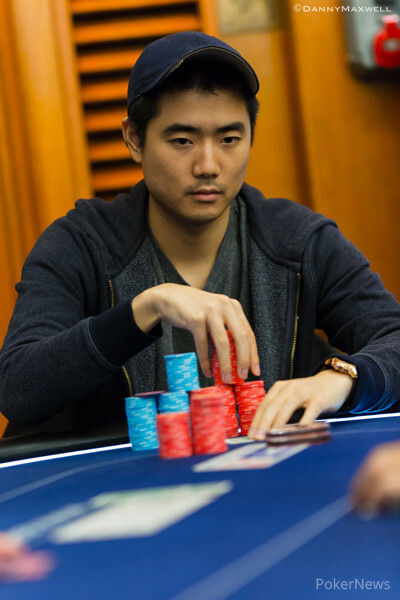 Andrew Chen may be the lowest on chips but he is not giving up without a fight. In a three-way limped pot on a flop of Chen called a bet of 80,000 from Craig McCorkell and Fady Kamar folded. The turn card was the and Chen called a 140,000 bet. On the river McCorkell checked and Chen bet 400,000. McCorkell folded and Chen collected the chips. “Weird hand.” Chen said. “Maybe we had the same hand?” McCorkell reasoned. Soon after Chen defended his big blind from an open from Kamar. It got to the turn of a board reading before Chen bet 160,000. Fady made the call and the river card was the . A 360,000 bet from Chen took Fady a while to call but he did and Chen had to show . Fady beat him with .